A new story collection by one of Hungary’s top writers and war correspondents, set mostly in the contemporary Middle East. The Most Beautiful Night of the Soul is the latest story collection by one of Hungary’s top writers. Here are fourteen stories set mostly in contemporary Cairo and Iraq that reveal the dark realities in the life of one war correspondent. Told from the perspective of Cairo-based European war correspondent Daniel Marosh, The Most Beautiful Night of the Soul—set in contemporary Cairo and Iraq, as well as Israel, London, and Hungary—is about a journalist examining today’s most pressing Middle East conflicts and the lives of others even while haunted by his own demons. Daniel Marosh battles insomnia and hallucinations while fleeing a lying world and war zones through a dizzying blend of Xanax, opium, alcohol, and prostitutes. In “Winter in the Promised Land,” Marosh spends Christmas in a Jerusalem with an Israeli friend, a special forces soldier who ensures his kids a happy holiday thanks to a raid in the Gaza Strip. In “To Kill an Arab,” Marosh confronts troubling truths when a Kurdish commander in northern Iraq invites him to view the interrogation of an ISIS suspect. In “Banana Split,” Marosh and an American journalist colleague pass a dizzying night with a prostitute in Cairo, and the next morning his conscience conjures up a troubling image. But is it real? In the title piece, Marosh moves into a Cairo brothel after the madam comes to his rescue when he is beaten up in a bar by British embassy employees. Written in the tradition of journalism that becomes literature in capital letters, in spare, gritty, Hemingwayesque prose, The Most Beautiful Night of the Soul is a window on a disquieting reality where other Middle East–based journalists rarely dare to tread. 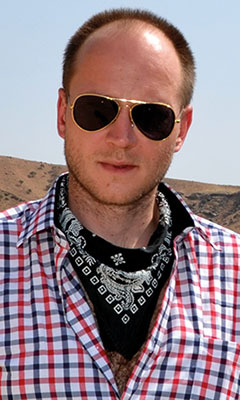 Sándor Jászberényi (Shahn-dor Yahs-ber-ay-ñee) is the author of The Devil Is a Black Dog: Stories from the Middle East and Beyond (New Europe Books, 2014). In 2017 he received Hungary’s Libri Literary Prize. As a correspondent for Hungarian news sites, he has covered the conflict with Islamic State, unrest in Ukraine, the revolutions in Egypt and Libya, and the Gaza War. His writing has appeared in the Wall Street Journal, the New York Times Magazine, AGNI, and the Brooklyn Rail. He divides his time between Budapest and Cairo.